The cookie is a rare food item. The cookie is crafted using two pieces of wheat and one cocoa bean. This makes it expensive to craft because the cocoa bean can only be found in loot chests. 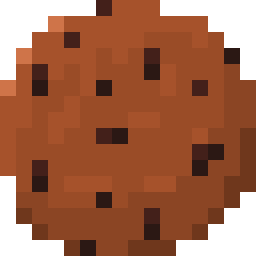 The cookie can be eaten like most food by shift-clicking. The cookie heals 3 hunger points and 12 seconds of regeneration.